Next First published 2 February 1996, but I am constantly adding more. Some of the Alfa Romeo Spider 1966 to 1994 details over the years. An extensive list is here over the points of significance. When the first spider, named the Duetto in a competition, was launched at the 1966 Geneva Motor Show, it attracted a mixed reception. BTW, Alfa Romeo never launched the Spider under this name, they only used Alfa Romeo 1600 Spider in the official sales material. The name Duetto was abandoned by Alfa, there was a biscuit! with the same name and Volvo had a delivery van with a similar name, the Duett in the 60's. Many spectators felt that the Pinifarina-designed body missed the mark. But everybody agreed the new Alfa drove delightfully. Its 1,6-litre alloy engine and sharp handling were universally praised. The low, artfully sculpted body incorporated a degree of curvature below the waistline that was still quite startling in 1966. The overall profile was typically Pininfarina, seemingly shaped by the wind and extremely smooth and harmonious in profile. Much was done to keep the shape as clean as possible. The front end itself was very low-set with a plunging bonnet line that contributed to negative lift. Integrating the bumpers and Alfa grille into the low front end, using Perspex cowls to cover the headlamp cutaways and designing a soft-top that could fold almost completely out of sight also helped. As a result the Duetto boasted extremely good aerodynamics for its day, confirmed by Pininfarina’s extensive use of wind tunnel testing at the Turin Polytechnic. The Duetto was a good example of Alfa Romeo’s emphasis on aerodynamics, born in the 1950s with the Bertone-styled Berlina Aerodinamica Tecnica (BAT) series of prototypes. Headlamp cowls by Perflex. Popular design like Ferrari and Jaguar E-type. Alfa continued until the mid '70s with this arrangement in Europe. The 1750 Veloce had the same cowls in Europe. Today, they are hard to find so in case you see a pair, buy them! Thanx to James D. Thorburn, who has contributed with the following information about lights. In the early part of this century, all cars had headlights with a replaceable bulb. These worked for awhile but the bulbs would quickly darken with age. In the 1930's, someone (I believe General Electric) came up with a "sealed beam" headlight. The best way to describe it is that the entire headlight is the bulb. The filament is sealed inside the headlight. These sealed beam headlights were state of the art in the 1930's. They were brighter and did not darken like the headlights which used bulbs. Shortly thereafter, the US government required that all new cars sold in the US be equipped with sealed beam headlights. Like all technology, however, the sealed beam became out of date. By the 1950's the quartz iodine and quartz halogen bulbs were developed. Of course, these bulbs were much brighter than the sealed beam headlights and did not darken. Everyone went to these type of headlights except the US where the out of date regulations prohibited their use. You should note that these regulations also prohibited the use of any type of headlight cover. Thus, none of the US Alfa Spiders came equipped with headlight covers. Alas, only the lucky Europeans were treated to the beautiful headlight covers on the Duetto. 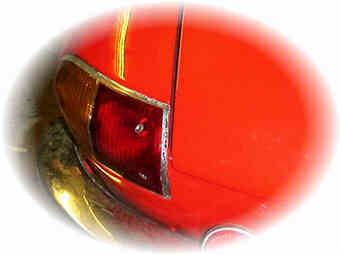 In the late 1970's some of the headlight manufacturers incorporated a quartz halogen bulb in the sealed beam headlights. This was an improvement but was nowhere as good as the H4 headlights used in Europe. By 1985, the regulators finally figured out that the sealed beam headlight was hopelessly out of date, and allowed bulb type headlights. However, the type of bulb and wattage was severely limited. It is only within the last two years that H4 bulbs have been allowed in the US, but the regulations still only allow a maximum of 65 watts on the high beam. The sealed beam headlights look almost identical to the H4 round 7 inch headlights. They are also interchangeable, that is the mounts are identical. The sealed beam headlights just do not perform as well. The euro cars do have a different frame inside the wing (fender) which allows the headlight bowl to mount from behind. It then has a very thin stainless steel finisher which mounts around the wing aperture. The headlamp itself is held in place with a chrome retaining ring. The US cars had a larger chrome finishing trim & the headlights were mounted from the front. I am sure you can fit the Carello Perspex's without changing the headlight but you may need to modify the large chrome ring a little at the top. The round-tail is also nick-named "boat-tail" and "Osso di Seppia", which means "cuttle-fish-bone". In Germany people say "Rundheck". Anyway, the design still looks very attractive. The choice for the name of the new car was decided by a competition. The name Duetto was one of more than 140.000 entries. The winner, Sig. Guidobaldi Trionfi from Brescia, got a brand new car as a prize. Among the other suggestions included Gina Lollobrigida, Bardot, Piranha, Acapulco, Shakespeare! Al Capone, Pizza, Stalin, Sputnik, Edelweiss, Gin, Strip, Goal and Hitler! Duetto is nicer, much nicer. Wheels were 15 x 4.5in with flush-fitting separate-clip hub caps made by CMR or Fergat. Optional dimension: 15 x 5in and 15 x 5 1/2in. Today, 6 x 14 is the most common and best liked size. Alloys look very nice on the Spider. Momo made several good-looking wheels for the Alfa Romeo. My personal favorite however is the Revolution five-spoke by Wolfrace. I have these on my Spider. Front light units amber/white and rear light cluster amber/red. All European round-tail spiders look the same in this respect. In the US the cars had white/white in the front and the rear was red/red. The units were made in three pieces. The lenses in plastic, the chrome and the transparent cover. They are hard to find today, but they have been re-manufactured so do not give up. Most of the vendors are still able to find them for you. 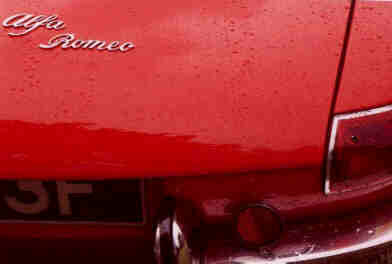 Boot lid badging was Alfa Romeo"-script on the right side. The engine size was not exposed. Perhaps the spectator was supposed to use his imagination. Badging on the Duetto was notable by its absence. Indeed there were only four badges: two Pininfarina ‘F’ crests (one on each lower rear wing just aft of the doors), the Alfa grille badge and chrome script on the boot lid reading ‘Alfa Romeo’. There was not a single reference to the car’s actual name, Duetto. In Italy the government taxed cars by the size of the engine. This is one of the many reasons for the Italian interest in tuning combustion engines. The bigger size of the engine, the more you had to pay in taxes. Small engine with lots of power, less tax. makes sense, right? Grill showing raised dimple just over the grill in the front panel. Traditional badge with cross and serpent plus Milano. 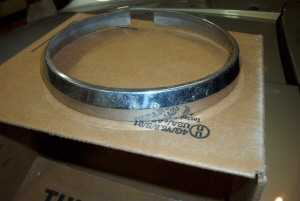 The grill and bumpers are made of stainless steel, quite uncommon in 1966. Not many cars from that age had the same quality. The grill had five bars. Later, Alfa Romeo made grills with six and four bars. Pininfarina actually built the bodies at its Grugliasco plant in the suburbs of Turin. The completed metalwork would then be transported by road to Milan, to the then-new factory at Arese where the Alfa Romeo 105 series mechanicals were installed and trim put in. The body shell was welded to the floor pan and reinforced with box-section beams running longitudinally and across the car. Front and rear bumpers were separated by grill in front and at rear by license plate. The photo shows a Scandinavian Round-tail with optional Revolution rims, a popular out-fit. The exhaust tailpipe exits the bodywork with the split bumpers on each side and comes out to the left of the license plate. One of the most attractive aspects of the Duetto was the extreme cleanliness of its shape, making do without cosmetic flourishes and superfluous bright work. What body trim there was, was perfectly integrated within the whole. A perfect example was the front grille. The traditional Alfa Romeo shield grille was incorporated very low-down so as not to interrupt the curvaceous line of the nose. The grille itself was wider than the Giulia saloon’s, and consisted of a chrome surround fitted with five chrome horizontal bars. The circular Alfa Romeo badge sat at the top of the grille, protruding slightly above the nose line to create a small ‘character’ prominence in the metalwork that drew attention to the badge itself. The chrome front bumpers were also beautifully and unobtrusively integrated within the overall shape. To each side of the grille, the bumpers were made up of two main sections mounted on a stumpy T-shaped bracket: an upper ‘moustache’ with the sort of hockey stick shape that was so popular in the 1960s, and a lower bar that followed the gentle curve of the upper bumper. The bumpers were set back within indentations that led to the air intakes that actually channeled cooling air to the engine bay. Alfa Romeo has often faced problems over where to site the registration plate, since the logical central position is often taken by the prominent grille. The Duetto was a prime example. In Italy, the small front plate then specified by the authorities could be attached quite inconspicuously below the lower bumper on the right-hand side looking at the car head-on. Other countries’ larger front plates posed more of a problem, more because of aesthetic awkwardness than ground clearance difficulties. As a result many Duettos had their plates mounted from the top bumper bar, looking rather out-of-place (in California this was mandatory according to the safety regulations). 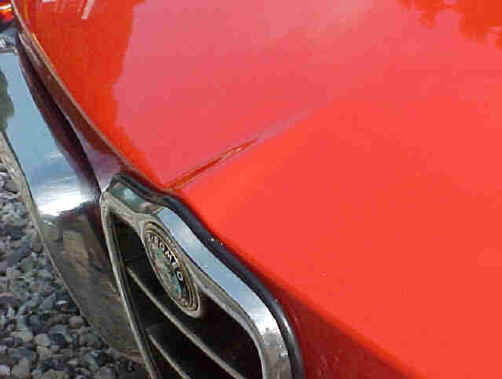 Alternatively an adhesive plate was often stuck on the nose, between the grille and leading edge of the bonnet.